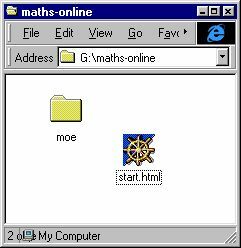 You can download maths online (except for the Forum which is purely online since July 2002) in a compressed zip file. Since the program is updated continuously, please visit this page from time to time in order to check whether there is already a more recent download version. You have two possibilities to download maths online. For the first one, you must run an unzip program (as e.g. WinZip under Windows or the Stuffit Expander on the Mac). In the second case, maths online unpacks itself without the need of additional software. maths online will need between 7 and 22 MB of hard disk space. Click one of the two links and save the respective file at your computer. Extract the files contained therein into a folder of your choice (in the first case by running an unzip program, in the second one by double clicking the exe file's icon). You will find the file "start.html" and the sub-folder "moe" - nothing else will be changed at your computer. If you like, you can delete the zip or exe file now. Start maths online by opening the file "start.html" in your browser or by double clicking its icon. Hint: For further software see the page Download resources.